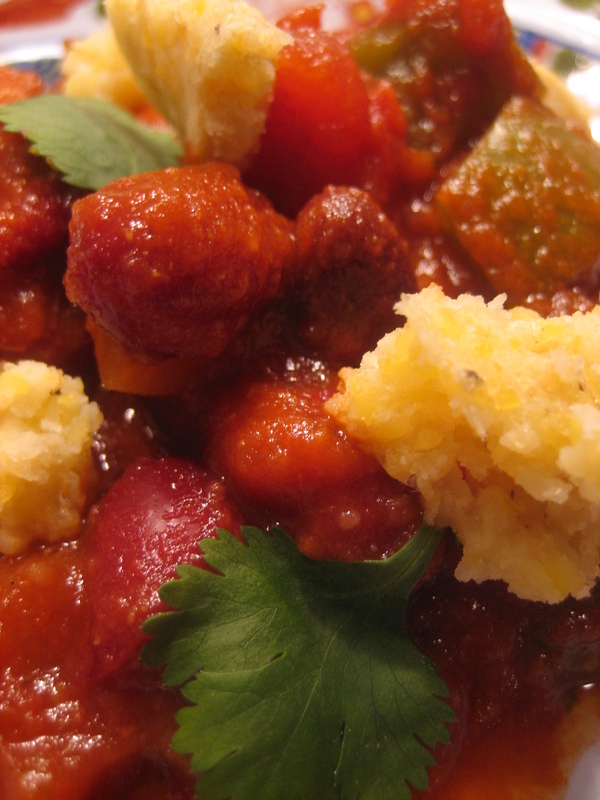 Chili is one of those comfort foods that people love to see at a game day party. It is so versatile it can also be used to top nachos and burgers, hot dogs and even atop pasta. This is a really simple and tasty version that leaves a great deal up to you. When I say that it’s up to you I mean, for example, that if you do not like black beans don’t add them and simply add more kidney beans or another bean. If you like your chili extra spicy or mild, adjust the chili pepper amount to suit your tastes. I’ve provided the amounts I used but as I’ve said, be creative and add what flavors you like. This recipe makes a ton of chili, enough for a game day party; it’s a good thing it freezes so well. H made some cornbread that was delicious crumbled atop the chili. Garnish with whatever turns you on be that cilantro, sour cream, fresh tomatoes, red onion or crushed tortilla chips. Drizzle a bit of canola oil in a large stock pot and cook the onion, garlic, poblano, jalapeno, serrano and bell peppers until softened. Add in the beans, the fresh tomatoes and all the tomato products including the juice. Add in the chili powder and cumin. Stir well and cover. Simmer on low for a couple of hours adjusting the consistency to your tastes with water. Season with salt and pepper.